Make sure you have a flashlight handy. Previously teased through a registry entry on Steam, it's now been confirmed that the spin-off sequel to Remedy's Alan Wake, Alan Wake's American Nightmare will get its own PC release this summer on May 22nd. A pre-order page for the third-person action-horror title went up on Steam earlier today, showing that American Nightmare will retail for $14.99 at launch. Interested parties can nab the game for 10% off if they purchase the game before it goes live in May, and owners of the original Alan Wake, which is also available on Steam, can get an additional 15% off the retail price. The original Alan Wake starred writer Alan Wake as he investigates to rescue his kidnapped wife during a vacation in the fictional town of Bright Falls, only to find himself pit against an evil entity known as the Dark Presence. 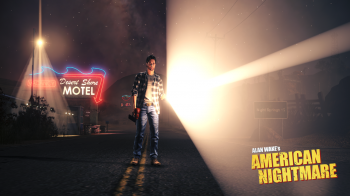 Alan Wake's American Nightmare, originally released for XBLA, continued Alan's war against the Dark Presence, this time battling his evil double, Mr. Scratch, in the alternate world of Night Springs.